- Libro de ejercicios del cuarto tomo de la serie y primera parte del nivel HSK 4 del método de aprendizaje basado en los contenidos del examen oficial. - Indicado para usarse junto con el libro HSK Standard Course 4B (Shang)- Textbook (Libro + CD MP3) Serie de libro de texto basada en el HSK. - Especialmente recomendado para aquellos que además de estudiar chino, deseen con la máxima economía preparar los contenidos esenciales que se requieren para aprobar el examen oficial. - Maquetación atractiva a color. Authorized by Hanban, HSK Standard Course is developed under the joint efforts of Beijing Language and Culture University Press and Chinese Testing International (CTI). With HSK test papers as its primary source, HSK Standard Course is characterized by a humorous style, familiar topics and a scientific course design. Matching the HSK test in all aspects, from the content, form to the levels, it is a series of new-type course books embodying the idea of "combining testing and teaching, and promoting learning and teaching by testing". It is suitable for the Confucius Institutes in different countries as well as other Chinese teaching institutions and self-taught learners. The whole series is divided into six levels matching the HSK test, with one volume for each of Levels 1-3 and two volumes for each of Levels 4-6, totaling nine volumes. With a textbook, a workbook and a teacher s book in each volume, there are altogether 27 books. 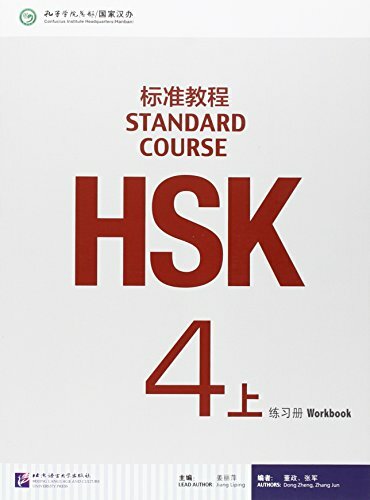 This is the workbook of HSK Standard Course 4A, including exercises for each of the 10 lessons in the textbook, one HSK Level 4 model test, and a Chinese-English introduction to the HSK Level 4 test. This book can help students succeed in the HSK Level 4 test and all-roundly improve their Chinese competence and proficiency. The workbook is illustrated with plenty of photos matching the style of the test. An MP3 CD comes with the book. Professor Jiang Liping is a postgraduate tutor in Beijing Language and Culture University whose research focuses on the theories of teaching Chinese as a foreign language, teaching methodology and textbook study. Ms. Jiang s works include books such as On Teaching Chinese as a Foreign Language, Ways on How to Teach Foreigners Chinese and Classroom Expression Course for Chinese Teaching as well as more than 10 papers published in Language Teaching and Linguistic Studies, Chinese Language Teaching and other journals. She has given lectures in many countries and cities, such as Japan, the United States, Thailand and Hong Kong.